BEST TIME TO VISIT: Anytime. COMMENTS: Near the water. There is a store that still operates and caters to the tourists, fisherman and campers. REMAINS: Summer residents. Some structures and pioneer cemetery. 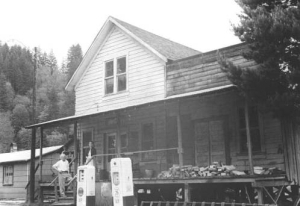 In the town's early days, Elk City was the western terminus of a toll road operated by the Yaquina Bay Wagon Road Company. 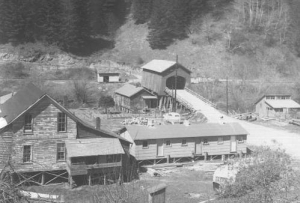 (It is quite possible that the first structure built in Elk City was the warehouse of the road crew.) Stagecoaches came from Corvallis over the toll road, bringing mail as well as hunters and fishermen to the town. 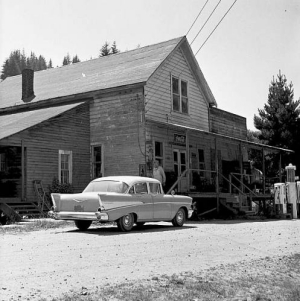 Even before the railroad arrived, the town had two hotels for weary travelers who would spend the entire day crossing the Coast Range on the toll road. After spending the night in Elk City, travelers just passing through boarded ferries to nearby Newport, Toledo, Oysterville and Yaquina City. The settlement of the area and construction of the toll road rose from the demand for oysters in San Fransisco. Yaquina Bay teemed with fish and shellfish, but resided on the Coast Reservation, set aside for Indians in the 1850's. 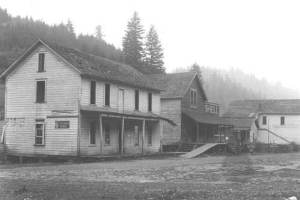 Settlement was minimal and un-official until 1866, when Oregon senator James W. Nesmith (who, ironically has another ghost town named after him, called "Nesmiths Mills,") had much of the Coast Reservation dissolved and opened to settlement. 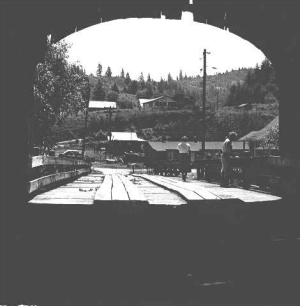 After functioning as an outdoorsmen's resort and road stop, the town existed in the 1880's as a railroad construction camp when a push was made to extend railroad service from the coast to the Willamette Valley. It is said that Chinese labor was used to help construct the tracks during this period. After the completion of the railroad in 1885, Elk City became, once more, a peaceful resort for hunters and anglers. The town had a store, hotel, livery, a train depot and Wells Fargo express agent. 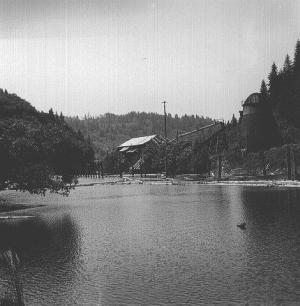 The onset of the Great War boosted the economy of the town with the construction of saw mills. 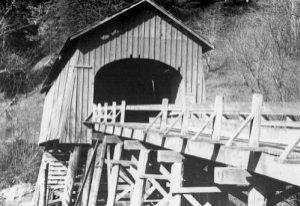 In 1922, a covered bridge was built, and it is said to have once been painted red. 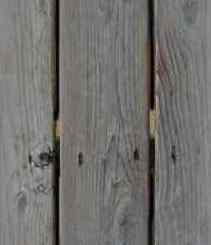 The demand for lumber peaked again during the Second World War, but it was short-lived. 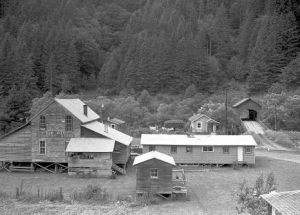 Post-war, Elk City declined, and many buildings deteriorated, as seen in the legendary journalist Ben Maxwell's photographs. 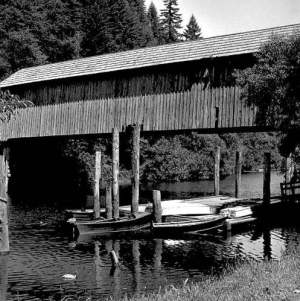 Efforts to save the dilapidated covered bridge came to a tragic end in 1981, when a windstorm blew it into the river while it was being restored. The frame was destroyed during an attempt to raise it, and was not re-built. Today, the status of the town is unclear. Some have said the towns only store has closed, but satellite maps reveal many homes and structures still standing in the area. Elk City Cometary would be worth a visit, as it holds the graves of many pioneers. We like uninhabited places where once was activity. So we did some Ghost Town hunting during our trip to the Westcoast. We arrived from the south. The drive to Elk City finished with 7 km of unpaved road in an very romantic setting. But Elk City itself was a not a bit the kind of abandoned place we where looking for, It contains a small but nice state sponsored campground with a semi-permanent (summer only?) host. The city center consists of half a dozen mostly rund down buildings. The general store is closed. But within 2km of this center there are many nice and well kept houses. We where somewhat disapointed: it sure was a nice drive but we where looking for relicts of pioneer days. The locals seemed to be quite hostile. But the Campers where delighted to find some Europeans interested in their History. They came for many years to Elk City for fishing and holiday and they remembered that "Devils Well Road" was renamed a few years ago and before was named "Cemetery Road". A week ago there had been an other guy asking for the cemetery to find his ancestors. We followed the unparved "Devils Well Road" for 5 km or so without finding anything. Then we turned back and just before getting back to Elk City Road we saw a single tombstone to our right (downwards the hill). Drive up "Devils Well Road" for about 500 m then take the next trail to the left for 50 m. The Cemetery is to the right between the main road an the trail you have taken. If you are into serious Ancestor hunting, bring a Scythe. There is serious undergrowth and most Tombstones can only be found after slashing through the scrub. Some background on the City can be found at Historic Elk City. The Campinlot is described here. Pictures from the city can be found at flickr.